Many years ago, I had a friend and neighbour, Gloria, who was brutally frank. Once, she threatened to cut up a dress I had worn too much. But this story isn’t about my relationship with her ’cause I wasn’t the only one she confronted with her well-intentioned meddlesomeness. Seemed that every teenager in the neighborhood was afraid of her and for a rather hilarious reason. Hilarious to other people, though, not to the teenagers at the time. You see, Gloria was a mother. She pushed her kids to do well and she did the same to every young person she knew believing, perhaps as Africans do, that bringing up a child is not the responsibility of the parents alone but of the whole community. Another way of putting it is the African proverb: It takes a village to raise a child. On and on she would go, asking about JAMB, what you intend to study, whether you are attending extra lessons to improve your grades and so on. And she would insist on getting clear answers to her inquiries. She would top off the conversation with some words of commendation, rebuke, encouragement, a quick prayer, or blessing as the occasion demanded. But Gloria’s approach, heavy-handed though it seemed to them, helped to keep a lot of young people in the neighbourhood focussed and diligent so that in the event they had to face her, they would have the right responses to her questions, the responses that would make her praise, rather than berate them. Perhaps you had a Mummy Gloria in your extended family or neighbourhood while growing up, kindly share how your encounters with him or her affected you. Or maybe you have been a Mummy Gloria yourself. How have young people and others responded to your “well-intentioned meddlesomeness”? *WAEC in this context refers to O’level exams conducted by the West African Examinations Council. *NECO in this context refers to O’level exams conducted by the National Examinations Council in Nigeria. *JAMB here refers to the university admission exams conducted by the Joint Admissions and Matriculation Board in Nigeria. It was such an attitude by a teacher who happened to live near us back then in my late primary school education that finally made.me to start reading! Mama Chisom obviously beat me.more than my parents(combined) did! Painful but I'm now grateful to her. Lol! I'm glad you heeded her correction, Chikwado. Praise God! Pretty intersting. Ma. Your blog has helped influence lives positively including mine. See you upon resumption. This gave me a striking remembrance of my pry 6 teacher Mrs Gift. We her students tagged her "the troublesome fellow" but the reality is that it helped us improve in our studies. Thank you ma for this wonderful piece. Praise God for people like Mrs Gift. And bkess you, Victoria! This is Wonderful piece, Ma. Let me acknowledge that we still have numerous Glorias around, and although they help in bringing out the best in children and youths, oppositions from parents who perceive them as enemies and haters of their children make their number to dwindle. Some parents who pamper their kids attack those Glorias in our society. God himself, in Hebrew 12 vs 5b - 6, warns us against scorning correction and resenting training, and tells us that He (like Gloria(s)) trains those He loves, and chastises every son He accepts. Specifically, in verse 11 of the chapter, he says, "of course, any discipline is at the time a matter for grief, not joy; BUT LATER, in those who have undergone it(the trainings and corrections), it bears fruit in peace and uprightness". You're quite right. We Africans are losing the communal lifestyle to modernity, so some parents don't take kindly to others correcting their children. And like the scriptures you quoted pointed out, the children corrected are usually thankful to the Mummy Gloria in their life when they grow up. Mmmh...I am feeling nostalgic already. I had an 'Aunty Gloria' in my church as a teenager. I always ran, especially when I know I had some explanations to make for one or two things that transpired somewhere, somehow. But, now...I relish those beautiful moments. They helped to mould me. Thank you Ma for the wonderful piece. Yes, my desr, thank God for the Glorias that God sets on our paths to guide us. Welldone ma. I see people like Mummy Gloria as community builders. They are there in the neighbourhood, at work place, school and church apparently prying. All they really want is to see that people do the right thing. And my take home is one must not be a mummy to be a mummy Gloria. Awwww, that is so lovely, Juliet! You are a willing instrument and God will bless many through you in Jesus' name. Glad to hear you heeded her admonitions. Unfortunately, many young people consider such people enemies. Yeah, from hindsight we see they were not the dragons we thought they were. Shalom! AHH! This story is so cool, it reminds me of old time. something similar happened to me, only it wasn't mummy gloria, but mummy ugo. lol. You must be thankful for this Mummy Ugo now, but I can imagine that her ateentions were annoynig and tiresome then. Bless you! But his attitude will probably make your friends to aspire higher. Shalom! Thank you so much, my dear! May you never lose your focus in Jesus' name. A nice work ma. If we could have many 'mummy Glorias' in our society, the world will be a better one. But the problem is that in this contemporary world, people including parents will always expect and tell you to mind your business and stop putting nose in other's matters. May God help us. Lol...Mummy Gloria is funny, putting young people on the spot like that. Well i have an aunt who believes its her duty to correct any young person because of her Christian faith, mostly on dressing not usually on everything about a person. moreover she talks to any young person not necessarily someone she knows. Its good but could be quite embarrasing. Nice article, well written Ma. Thank you, Nneka, and thank God for the Mummy Glorias in our midst. You are blessed! mama Gloria is nice woman with passionate love for kids even though she may seem rude, but that is just to help the kids to study and be focused, that reminds me when I was a kid, I had an uncle who acted so rude whenever he is around I and other kids play good guys but whenever he is not around we play roughly I never understood the impact his rudeness had on me until this day, thanks to mama Gloria once again let people like her never cease in our society. I agree. Bless you, Chiamaka! this is so funny. if there was an Aunt Gloria in each community, youngsters would be much more focused on their academics. well done, ma! Yes, my dear! You are blessed! We teenagers do not like grown-ups admonishing us on how to live our lives, because we feel we have known it all but in the real sense is for our own good because the bible said train up a child in the way he should go, and when he is old he will not depart from it. We should know that bringing up or training a child is not only the work of the parents but also the entire society. Trust me I know what it feels like to have someone like Aunty Gloria. Burdensome and tiresome as it was, it still made one work harder and behave properly. I knew we all needed some space from her unending queries but any time she was not around, we knew something was missing. Lol! Gloria’s ways are right because she tries her possible best to train everyone as she could. Although she poke noses, she does it with a good heart. Teenagers and the pranks they play, always grabbing the unfruitful aspect of whatever situation they come across. It’s normal shaa! but children of nowadays really need to upgrade, that is, instead of run, run and run, they should endeavor to do that which madam Gloria emphasizes on for their own good. Gloria has a lifestyle that should be appreciated in the society. i too came across such a person. mine was my choir mistress sha. she always wanted her choristers to be bright and God-fearing.. Awesome! Gloria is a woman with a difference, so other christian mothers should learn from her. Lol! Hilarious indeed. Well, this story casts my memory back to the experience I once had with one Bro. Onyeka, a neighbour in my residential apartment, when I was 5 years. I was an academic dullard to the extent that I can't spell my names appropriately. At the end of each term, I always came last in position. Bro. Onyeka was irked by my academic performance. He always spanked me whenever he saw me playing with my siblings or playmates. When I was in primary three, I got tired of his spanks and mockeries. I started working extremely hard and prayed fervently in order to make my academic ends meet. Through God's intervention, I was disentangled from the shackles of poor academic performance. I never remained the same again. The responsibility of training a child is indeed a two-centered responsibility; it is the responsibility of parents and the community as well. I think we need to move back to those times where the responsibility of training a child belonged to not just the child's parents but the community as a whole. this is because the society was better off, unlike today where no one cares, and the only ones that care have been confronted with the "mind your business" phrase. I love Gloria's reasons for bombarding people with questions, especially the way she wanted to see everyone succeed and not to make sure her kids were better off than the rest of the people in the community. but I'm sure Mrs. Gloria will be my Mum's best friend if she lived on my street so that they can torture me together. Run, run ,run focuses on Mother Gloria who played the role of policeman of their community having at the back of her mind the Africa philosophy that the responsibility for rising a child is not exclusive to parent but a collective duty of the village. LOL..."Mama Gloria is coming" reminds me a lot of my childhood. i once had a 'mummy Gloria' in my neighborhood, but hers was not a positive one. she would always want to find out about what is going on, with the sole aim of making it her gossip topic. indeed, it is true that it takes a collective effort to train a child. Truly, a child doesn't belong to his immediate family alone but to the whole community. Therefore, everyone in the society contributes to his upbringing. It is not unusual for a "Mummy Gloria" to be present in an African society and trust me, the "Mummy Glorias" may be perceived as being nosy but they do a lot in grooming young ones. My aunt will even go as far as relationships and the friends you keep. i used to hate it then, but I understand now that she only wants the best for me. nice write up ma. Apart from the family, society is another form of socialization,it breeds the children which turns out for the good of the whole community at large. LOL.. This brought memories. My pastor's wife can be like mummy Gloria and I used to see those attitudes of hers as not "minding your business, but in the long run, they actually helped to shape me because I had to do some things with the mind of "what would she say"
Mrs Gloria is a caring person but people misunderstands her because they believe that there is nothing that she is going to do with the information that she is requesting. Mrs Gloria on her part should reduce the number of questions she is asking them, she should make it seem like she is concerned rather than making them feel like they are answering waec questions. I have definitely met so many Mrs Gloria in my life and it wasn't funny at all. For me it's just snooping and gossip because you can't tell me that after squeezing out all the information from you, she can't just keep it to herself.smh. No doubt Mummy Gloria is troublesome but with the way things are going in the society I think we should have more of her if that will help curtail the ills in the society. Mummy Gloria was actually doing the right thing, but many people will see it as "busy body". I have an aunt who always advices me, her advice could last for hours, i always get bored and tired of her that i started avoiding her but right now i can still remember some things she told me and it has been a guide to me in the university. I have learnt to always give a listening ear to people because no knowledge is a waste. Interesting ma. Mrs Gloria is a good example of African women who do not only discipline or want the best for their children but also the same thing for other children, because they believe that it not only the work of parents but a collective responsibility. God bless you, ma. I had a Mummy Gloria in my teens. She was actually my first aunt. It felt like she monitored every end of the school term to come visiting. After greeting everyone at home, the next thing she'd ask for was our results - mine and my siblings. After which she condemmed us if there was so much as a number written with a red pen in our result sheets. It was annoying but it helped build me up and I ended up winning awards while graduating from high school. When you get rebuked or scolded, you get more inspiration to work harder. There is an anger that comes over one after being rebuked. This anger drives the person to prove the person who rebuked him or her wrong. This is where hardwork comes. We should all take every comments both negative and positive in good stride and work towards achieving goals. This reminds me a neighbour, who always cares for me, even in this higher institution. I call her "mama". This caring woman always buy me some foodstuffs including some cash whenever I want to come back to school. She doesn't do it to only me, she does it to other three undergraduates I can testify of. Mama can be compared to Mrs Gloria. I appreciate ma. I actually have a mummy Gloria in my life. At an earlier stage in life,I didn't take many things too seriously but she helped me change all that and put me on a right path and I thank God for her in my life. Boss lady, we should call her. In every household and neighborhood, there is a Mama Gloria. They would always want to offer advice when you least want them, just to make you better, but we never wanted. I dodge conversations with people like her then because i felt it was nosey, however, with time i appreciated the concern. Bless you ma. Its common to youths, they dont really like their elders to question their act or criticise their actions which in future later lead them astray but i believe its not talking of their wrongs always but also correcting them sometimes in a soft tone which they can understand. I once had a mummy Gloria at the early stage of my life and he really helped me and am always grateful to God for him. Quite funny but interesting.people like aunty gloria should be appreciated,she is selfless not minding the fact that they re not her children, she tells them the truth rather than comforting them with lies and this encourages them to work harder to achieve something positive. Lolz.. Yes, I have one Mrs Pat, my Jss1 teacher but we named her "Atakatagbuo" . We saw her as a burden to us not knowing that she was helping us actually. Thank you very much ma for putting a smile on my face with this piece. Generally, the youths cherish being praised rather than being rebuked. Gloria is a type of person who wants everything to be done in a right way and going contrary irritates her, thereby attracting her attention to the person in question. She is also a caring mother who wouldn't want other people's children to go astray. The youths in our society need "Gloria" especially, in this digital age where youths or children are distracted. I as an adult need Gloria as well who will be asking me about my studies, some one who will be criticizing me if I do not do well as expected in my academic. I would like to say that every society needs a Mummy Gloria. Some times teenagers pay more attention to rebuke from an outsider than a family member, because that would tell to a great extent where your actions have gotten you to. I'm sure she made great impact in the teenagers of that community. May God bless every "Mummy Gloria" that has so much concern for the people around her. The problem with today's youth is that they don't like people monitoring them. They like freedom to do anything they want. We should also try to correct others whom we see doing wrong. They might not necessarily be our siblings. Thank you ma'am for this. I think I also need a well-intentioned meddlesome person in my life.more or less a Mentor. I had an annoying 'Mummy Gloria" In church. She focused more on the lipstick and the head tie you wore to church. 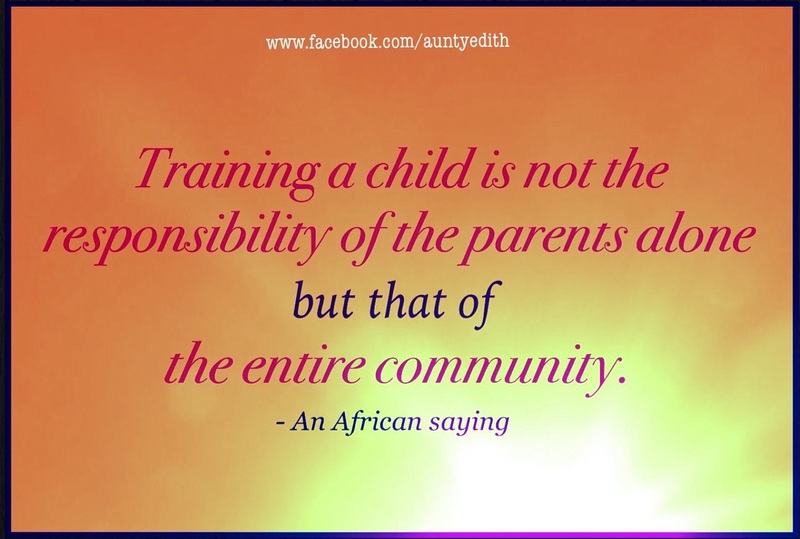 Truly, In Africa, a child is trained by the whole community. It is not only the family that trains a child. The family is very important because socialization is embedded in it. Such individuals like mummy Gloria is always in the community. I must be honest, children doesn't like anybody that exhibits such attributes of mummy Gloria. My childhood period in the community; I had the same experience, there was a nice woman in the community, she taught primary school and she has similar qualities with Gloria, that make us to always hide away from her. Despite the run, she played vital role in our lives, most of us became serious with our studies and look at where I'm today. Okay, you caught me. Lols! I hope I don't overdo it like Steve Sony advised. Have a pleasant night. That's just the African way. Surely Aunty Gloria has good intentions but it should be controlled lest it be perceived as meddlesomeness. If I lived in such neighbourhood I would also run!! In African settings, the likes of Mummy Gloria are not usually loved by youths and little kids at large. They feel they are supposed to be minding their business, little do they know they are really moulding them into sensible beings. The responsibility of taking care of a child or children in the society is for the community,that is why in Igbo society it is said "nwa bu nwa oha",this means,a child is for all. Interestingly, when I was younger, Mama Nnukwu (although late now) used to caution and sometimes flogged us for correction,which makes me believe that she had similar attribute with Mummy Gloria in story. Correction and a better us is all they seek. In Africa, it is not only the parents that train kids but the whole community. I think Gloria is doing her work as a member of the community. Actually for me I cannot tolerate someone questioning me about my life and it's progress. The acts of Mummy Gloria is a good one because it helps in the bringing up of youth in our society to a brighter future. Sometimes I find myself doing what mummy Gloria did, such as playing with my neighbouring children and out of that I will start enquiring from them about their age, class and subsequently their last term result, and their response is always different based on their performance, and at end many of them will feel eager to impress me by improving their grade. Actually as a young growing child, we don't really know the impact of these type of persons in our life, until we grow up to realize the role they played and its effects. Most youth detest people that scold or correct them often. I have an aunty like her, whenever she comes, I run and hide under my bed but later I realized that whoever that loves you the most will always chastise you whenever you eer. Oh yes!! I still have a woman like mummy Gloria in my life. Her name is Mummy Okochua. She is a wonderful woman and has this gift of interrogating young people. Back then, I would secretly wish never to encounter her in the church but it was always impossible and whenever I saw her, my heart would begin to beat very fast because I knew she would certainly have reasons to rebuke me. Many a time, I lie just to be free from her but now, I eagerly want to meet her and personally tell her of all my experiences as a youth. My mummy actually is my mummy Gloria. She disciplines a lot of children and inculcates good morals in them. Well, naturally, these people are not scarce in Nigeria. They end up eliminating some social vices from the upcoming ones that is against the society. Smile, My mummy Gloria for me would be my aunty Uju. Who stayed with us then, she would always make us do strenuous activities, Then i would complain but now i enjoy the rewards of the great seed she was sowing in our lifes. I will call mummy Gloria a "blacksmith". Before a gold reach to the point of glittering, it must pass through a harsh process which is "fire". Mummy Gloria is like a blacksmith (teacher) that nullifies gold (the youths) in order to be glittering (successful). She is a good teacher that equips the youths for their tomorrow. Those who hates critics will always be swimming in the pools of failure because they lacked unexamined life. This is actually funny, though it has some sense of truth in it. Personally, I believe that I would have avoided "Mummy Gloria" if I was in the same shoes as the teenagers. In the bigger picture, "Mummy Gloria" was actually trying to help the teenagers develop Sharper mindsets. Well done. Very interesting. If I were in their shoes I would really run because a youth like me wouldn't fancy interrogation like that. Although I've never had a Gloria in my life, it would've been beneficial to have one. Although most people may see this attitude as sticking one's nose in someone else's business, she obviously means well. Her inquisitiveness although scary is laced with good intentions. The youths become more serious and focused in their studies so as not to be embarrassed during her question and answer sessions. The saying, "it takes a village to raise a child," is then proved correct. It's inevitable not to find someone like mummy Gloria in every society. Noteworthy, is the fact that this persons are always mentioned in the success stories of many youths. Thus, they help contribute to the development of the society by inculcating priceless values in youths. If every child has a mummy Gloria in their life, the world will be a better place. Nowadays a little advice and children feel like you're burdening them with things that don't matter but at a later stage they will grow to appreciate and need more of those advice. I had lots of Mummy Glorias around me while I was growing up. probably because I was extremely stubborn. However, I believe that when it's time for a turnaround, it comes naturally though the Mummy Glorias helped a lot, especially when I had to quit doing some cunning things because I was afraid they'd catch me. So, having people like Mummy Gloria around one will contibute immensely to the upbringing process. Wow. Very funny and interesting. Many Anuty Gloria is needed in our society really it will go alot to help .Because nowadays some parents don't even ask their children how far about school and this making them not be serious. very amusing! Back then I got furious over people like Gloria. I felt they push so much than they should know. Little did we know that it was for our good. Wow.! I had come across women like her when I visited the Village in 2012 the old women can can interrogate they ask questions like this #KE AFA GU? O CHINELO NWA AGBOR BU ONYE MURU GI? KE MAKA NDI KANO?# and so on then I didn't understand Igbo so in order not to get caught up in a dialogue with these women I run and hide. Mummy Gloria was misunderstood she meant no harm it was her kind of person and I won't see anthing wrong with her. One of my neighbours behaves exactly like mummy Gloria and he gives gifts to children that perform well academically. Mumy Gloria doesn't mean bad for teenagers, for the fact she treats her own kids that way, she loves success,she is the kind of elders we need in our society today. We need people like mummy gloria in our communities because i believe that some parents do not have time for their children, mummy gloria is a nice woman who has good intentions towards everybody and wants every child around her to be successful. Ms. Gloria gives me a vivid mental picture of my pastors wife, unlike Ms. Gloria she doesn't pry into personal stuff, she corrects lovingly. She really helped me improve in my studies. God bless you ma'am for this piece. Mummy Gloria is wonderful woman. My mother is like her, always making sure that you do everything that necessary and I did not like it then but now l will everlasting thank her for such attitude toward us. Always interesting and enlightening stories ma. Madam Gloria is a rear kind,she wants to see other people's children doing well too.we need such disciplined people in every environment today. The funny thing is that i had a mummy Gloria in my neighbourhood while growing up. by then i used to think she was wicked but now i know her intentions where very good and has helped me go a long way. youths should listen to such people because you might not know what she is doing but you will get to know soon that it is for your own future. Exactly, I have a neighbour named Aunt Julie. This attitude of mummy Gloria relates to that of aunt Julie 95%. Her's was kind of annoying too to the teenagers in my neighbourhood because she condemned almost all our actions as teenagers. Most youths hated her a lot because she always said the truth the way it is. My opinion of her was a very sincere woman and loving one. She takes care of little children around. Each time, she buys sweets and biscuits for them to eat. The African saying that "it takes a village to raise a child" is true. When a youth is going a wrong way, it is not only the duties of the parents to caution the child, adults around can also help to caution that child. That is very good of Gloria,,She doesn't just want to see the success of her children alone but the success of all the youths. OH YEAH...I HAD AN AUNT GLORIA WHILE GROWING. AND TO AVOID HER QUESTIONS I RUN FROM HER. IT WAS LATER THAT I REALIZED THAT "IT IS HE WHO CARES ASKS" ALSO THAT MY REASON FOR RUNNING FROM HER WAS JUST BECAUSE I HAD NO POSITIVE ANSWERS TO HER QUESTIONS. THIS MOTIVATED ME TO PUT MORE EFFORTS IN MY STUDIES SO I WONT HAVE TO HIDE WHEN EVER I SEE HER COMING. NOW THE TABLES HAVE TURNED AND WE ARE FRIENDS. Wow very funny. I also have a Mummy Gloria in my neighborhood and she happens to be my church member too. She takes note of almost every thing that concerns teenagers and youths around her. I can still remember the day she made me wipe off my lipstick because she felt it was too "shouty" and countless occasions when she had to stop me on the road and remark on my dressing. But I must say she has a large heart. I still miss her cookies sha lol. The elderly ones should emulate her ways.it is true that youth are something else in this our time.but nevertheless,our elders should be more resilient in helping this young generation because we are the leaders of tomorrow. The success of an individual is the success of the family he is she is from and so is the community. our elders should emulate ways to help this generation.our elders should be more resilient and determine to make something good from everybody with because we are the leaders of tomorrow and the future lies in our hands. Very funny. Mummy Gloria is a very nice woman,she only has good intentions towards the youths in that neighborhood.She is a good woman because she advices youths on what to do. Though Gloria is optimistic, she is also a disciplinarian through her mouth and her approach and reactions towards youths. I had more of Mummy Gloria while, I was growing up as it was said, it takes a village to raise a child. I agree that she was meddlesome but she was trying to encourage us to do better, work hard and make excellent results and it is also said that if someone loves you they discipline you, so Gloria loves her neighbourhood so she tried to encourage them. I had more of mummy Gloria while, I was growing up and it is said that it takes a village to raise a child. I agree that Mummy Gloria was meddlesome but she was just trying to encourage us to put more efforts and work hard so we can get excellent results. There is an adage that says if someone loves u he or she disciplines u, so mummy Gloria loved her neighborhood that was why she disciplined them.